Higher-order ionospheric effects, if not properly accounted for, can propagate into geodetic parameter estimates. For this reason, several investigations have led to the development and refinement of formulas for the correction of second- and third-order ionospheric errors, bending effects and total electron content variations due to excess path length. Standard procedures for computing higher-order terms typically rely on slant total electron content computed either from global ionospheric maps (GIMs) or using GNSS observations corrected using differential code biases (DCBs) provided by an external process. In this study, we investigate the feasibility of estimating slant ionospheric delay parameters accounting for both first- and second-order ionospheric effects directly within a precise point positioning (PPP) solution. It is demonstrated that proper handling of the receiver DCB is critical for the PPP method to provide unbiased estimates of the position. The proposed approach is therefore not entirely free from external inputs since GIMs are required for isolating the receiver DCB, unless the latter is provided to the PPP filter. In terms of positioning performance, the PPP approach is capable of mitigating higher-order ionospheric effects to the same level as existing approaches. Due to the inherent risks associated with constraining slant ionospheric delay parameters in PPP during disturbed ionospheric conditions, the reliability of the method can be greatly enhanced when the receiver DCB is available a priori, such as for permanent GNSS stations. 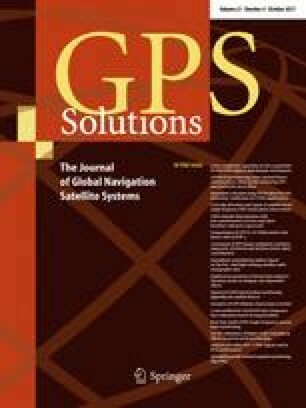 The authors would like to thank the International GNSS Service (IGS) for making GNSS data available and the Centre National d’Études Spatiales (CNES) for providing the satellite orbit and clock corrections used in this study. The project was conducted as a part of the International Association of Geodesy (IAG) working group 4.3.4 “Ionosphere and Troposphere Impact on GNSS Positioning.” This paper was published under the auspices of the NRCan Earth Sciences Sector as contribution number 20160445.